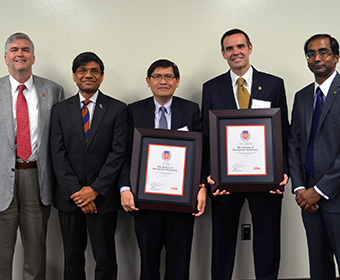 (July 20, 2017) -- The UTSA Academy of Distinguished Researchers (ADR) today inducted two new members: Joo L. Ong and Jose L. Lopez-Ribot. The UTSA Academy of Distinguished Researchers was established in 2015 to select and honor outstanding faculty who are accomplished scholars and who share UTSA’s continuing commitment to research excellence. The Academy aims to foster the highest quality of research and scholarly activity by UTSA faculty, and to promote the university’s vision as a premier public research university. The Academy is composed of researchers across all disciplines who represent the best of UTSA research. Each year, the Academy decides upon the induction of new members. Candidates are nominated by their peers, and their body of research work is subjected to intense evaluation. Academy members review each candidate, looking at all the criteria and discusses the candidates to ensure a lively debate. “There are many components the committee considers to measure the research and academic impact of a nominee. We are looking for high quality research and scholarly activities. It is a rigorous process to determine who is a true scholar,” said Hamid Beladi, chair of the Academy of Distinguished Researchers, and Janey S. Briscoe Endowed Chair in Business. The Academy considers a number of factors that include but aren’t limited to: the impact and the overall quality of the research, the number of citations and publications, publication in highly recognized and leading peer-review journals, recognized works, performances and exhibitions, competitive grants (federal and international) and funded research, patents, major scientific inventions, editorships and research recognitions. 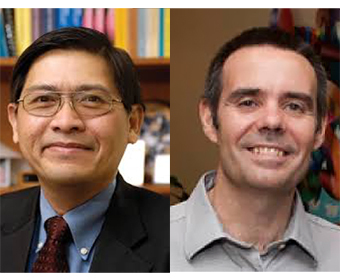 This year, two UTSA researchers were selected for induction. Joo L. Ong, Ph.D., is the USAA Foundation Distinguished Professor in the UTSA Department of Biomedical Engineering. He also serves as the associate dean of administration and graduate studies for the UTSA College of Engineering and is the interim department chair of the Department of Biomedical Engineering. Ong’s primary research focuses on modifications and characterization of implant biomaterial surfaces for dental and orthopedic applications, tissue engineered bioceramic scaffolds for bone regeneration, protein-biomaterials interactions and bone-biomaterials interactions. Ong is a Fellow of the American Institute for Medical and Biological Engineering. He is also the Associate Editor for the Journal of Biomedical Materials Research, Part B. His publication portfolio includes two books (one edited), 16 book chapters and 146 peer-reviewed journal publications. He has four issued patents from his research work and one pending patent filed with the US Patent Office. Jose L. Lopez-Ribot, Pharm.D., Ph.D., is a professor of Microbiology and the Margaret Batts Tobin Distinguished Chair in Biotechnology, Department of Biology. He is also the Associate Director of The South Texas Center for Emerging Infectious Diseases (STCEID). His laboratory studies fungal infections, with an emphasis on the opportunistic pathogenic fungus Candida albicans, the main causative agent of candidiasis affecting an increasing number of immune- and medically-compromised patients. Work in his laboratory encompasses from the basic biology of the cell wall, biofilm formation, adhesion and morphogenetic conversions, to the use of animal models to better understand virulence and host responses, to the more translational and clinical aspects such as antifungal drug development, drug resistance and vaccines; with the ultimate goal of devising new strategies for the diagnosis, prevention and treatment of candidiasis. In 2016, he was elected a Fellow of the American Academy of Microbiology. He is an author of more than 175 publications and several patents, and he has received funding from the National Institutes of Health (NIH), Department of Defense, American Heart Association (AHA), different foundations and pharmaceutical companies. He has also provided extensive service to his discipline as a grant reviewer for NIH, AHA, National Science Foundation, Veteran’s Administration and many other different national and international funding agencies, as well as an associate editor, editorial board member and ad-hoc reviewer for multiple Microbiology and Mycology journals. “The Academy of Distinguished Researchers serves as a way to recognize the high caliber of research being done at UTSA, and provide a forum for our researchers to connect and to collaborate. Our institutional goal is to be recognized as a research-intensive institution based on the scholarly output of our outstanding faculty members,” said Bernard Arulanandam, Interim Vice President for Research, UTSA. With today’s inductees, the Academy now has 15 members, representing the UTSA Colleges of Business, Education and Human Development, Engineering, Liberal and Fine Arts, Public Policy and Sciences.